If you enjoy the sound of running water, the Indian Creek Trail and Wildwood Canyon Trail at Wildwood Park in Thousand Oaks are for you. 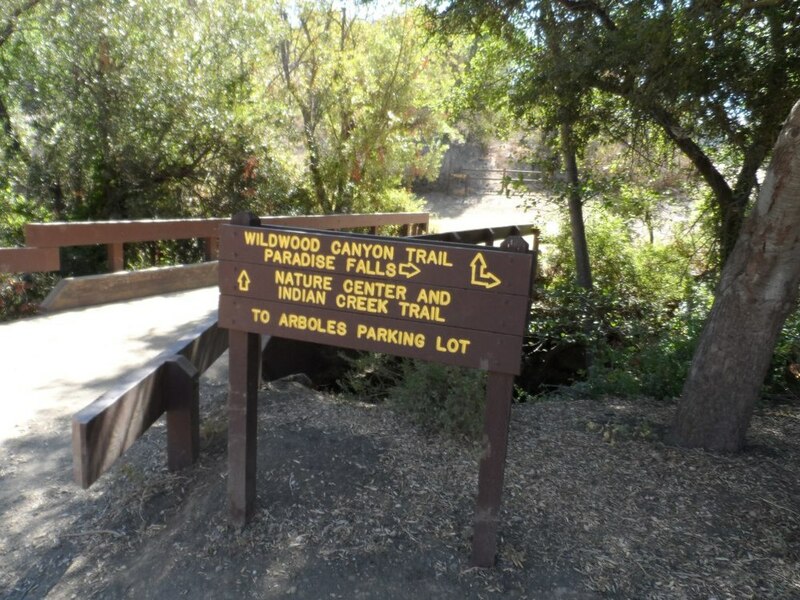 The Indian Creek trail can be accessed from the main Wildwood Canyon trailhead area parking lot at the east end of Avenida de los Arboles as well as at a separate trailhead on Arboles, slightly west of the parking lot. There are shady sections hidden among the trees and sections in the sun. Most of the trail runs along a creek that flows into Paradise Falls. This is not a completely easy hike as there are some hilly sections, a number of steps, and a stream crossing. That said, there's enough variety to make this a fun and interesting hike with the kids. Visit the Conejo Open Space Foundation website at www.cosf.org/website/html/moonridge-waterfall-creek.html for a handy map of these trails. About half a mile or so into the hike, you'll come across a fairly significant waterfall down below, way below, in the creek. Not as large as Paradise Falls, but definitely prominent. Adjacent to that area is a bench. And from there you have some steps and a stream crossing to make it down to the flatter section of the trail. The waterfall seen from the Indian Creek Trail. Be careful! Eventually you get to a bridge. If instead of crossing the bridge, you veer left (southwest), you'll be on the Wildwood Canyon Trail along the creek. This is a wide path that can take you on another little sidetrack loop up the Castillo Trail to Castillo Circle (street). A bit of a steep, roughly 3/8ths of a mile trail to Castillo Circle, where you can walk back to a separate trailhead via Velarde Drive north to San Miguel Circle to the San Miguel Trail. You'll end up back at the bridge area. The Wildwood Canyon Trail is pretty cool. Fairly flat, wide and runs along a creek. The water they say is mostly urban runoff but fun to check out up close with the kids. The Meadows Center next to the bridge has restrooms and a drinking fountain. The Conejo Rec & Park District leads many hikes here for s'mores and fun activities. The bridge that intersects the Indian Creek Trail and Wildwood Canyon Trail. Lots of options! Or, veer right (west) over the bridge, continuing on perhaps the Wildwood Canyon Trail southeast towards the top end entry into the Paradise Falls area (pretty cool to go this way). You can also sidetrack a bit by crossing the bridge and making a sharp right (north) to the short Indian Cave Trail and check out the Indian Cave. The Indian Cave is really easy to get to. Wear good hiking shoes though as it can get slippery. I slipped several times recently because the sole of my sneakers was so worn down. You can return to the parking area by either backtracking up the Indian Creek Trail or by taking the trail directly across from the bridge (basically go straight) up the steep, moderately winding path to a public access road (there is overflow parking available here) to the main Mesa Trail. From there, go right (east) back to the parking lot.